3D TV technologies perform in delivering convincing, comfortable, enjoyable and high quality 3D imaging and viewing experiences. So you’ve caught a 3D movie at your local theater and were impressed enough that you want to bring the 3D experience home with you. We do our best by presenting what we know about 3D TVs and 3D TV technology in general. These 3D FAQs answer in concise form, some of the most common frequently asked questions about 3D TV Technology. Our 3D FAQ has the 3D TV information you need to get started. What Do I Need to Watch TV in 3D? You’ll need a 3D display (a television or monitor), a 3D player (a 3D Blu-ray player, PlayStation 3, or cable box), 3D media (3D Blu-rays, games, or television), 3D glasses (for every viewer), and 3D-compatible cables. What’s the Difference Between Active and Passive 3D? This is one of the most frequently asked questions (or FAQ) about 3D TV. Active 3D uses active 3D glasses, which rapidly block each eye in time with images shown on the screen. Each eye sees something different, producing a 3D effect. Active 3D TVs provide higher-resolution images with less ghosting, but the glasses are pricey and need batteries. Passive 3D uses polarized glasses (like you get in movie theaters) that alter what each eye sees on the screen. The quality level is not quite up to par with active 3D, but passive glasses are much cheaper and don’t require batteries. The simple answer is NO. More than 4% of the American population cannot see 3D the way it is implemented today. This does not mean that these persons do not have depth perception when viewing real objects in space. At the same time, it also means that it is best to check your eyesight before investing in one of the latest 3D HDTVs. Do I Need Special Glasses to Watch 3D? Though glasses-free 3D tech is available, most 3D TVs require glasses. And not just any 3D glasses will do–you’ll need glasses from the manufacturer of your television. The old-style red and blue glasses definitely won’t work. Are 3D TV glasses interchangeable between brands? Glasses are currently proprietary for each manufacturer, so for example if you have a Samsung 3D TV, only the Samsung 3D glasses will work with it. In some rare cases manufacturers may be sourcing the same glasses from the same supplier. However, play it safe and only purchase glasses that are approved for use with your brand of TV. This is another very frequently asked 3D question. Most 3D movies released in theaters will also be available on 3D Blu-ray. Television options are limited, but a handful of networks broadcast in 3D, including ESPN. If you’re a gamer, Sony’s PlayStation 3 not only plays 3D Blu-rays but 3D games as well. You’ll find a number of 3D cameras and camcorders on the market, so you’ll be able to watch your home movies in 3D too. Can I Watch 2D Content on a 3D TV? 3D is really just a feature added to high-end HDTVs. Not only will you be able to watch in 2D on a 3D TV, but you should generally get a better quality picture than on a comparable non-3D TV. 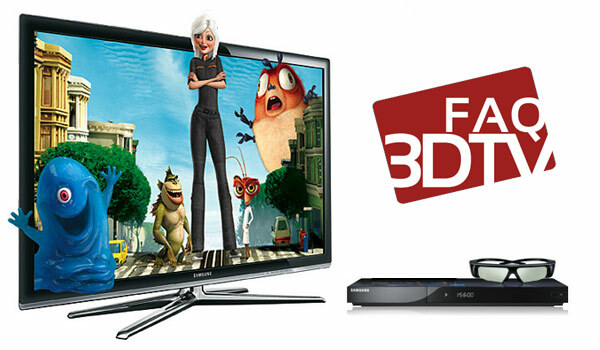 Learn >> Play 2D to 3D Movies on Panasonic Viera 3D Smart TV. Are There Any Health Concerns with Watching 3D? Though this 3D FAQ shouldn’t be considered medical advice, it is known that watching 3D programming can cause eye fatigue and headaches in some viewers–not unlike staring at a computer monitor for too long. This can often be alleviated by taking breaks from 3D viewing. However, if you have trouble sitting through a 3D movie at a theater, 3D at home probably won’t be any better. It’s estimated that 10% of people simply can’t see 3D effects due to vision issues that may not be evident outside of 3D viewing. However, if you can comfortably view a 3D movie in a theater, you should be able to see it at home as well. We hope our 3D FAQ has helped answer your 3D TV information needs! Thanks to a variety of very cool Pavtube 3D Video Converter Ultimate, it helped lots of 3D movie fans and very easy to use. It not only for Create 3D movies out of 2D sources, but also can create 3D movies out of source 3D Blu-ray content in 5 different 3D video formats: MKV, MP4, MOV, WMV and AVI for multiple 3D media players like HTC EVO 3D, LG Optimus 3D P920, 3D HDTV, 3D game consoles, etc. What’s more, this app is regarded as a great Blu-ray ripping program to help users to convert 2D/3D Blu-ray collections for various HDTVs including but not limited to Samsung HDTV, Sony Bravia HDTV, LG Smart TV, Toshiba TV, Hisense HDTV, Seiki TV, VIZIO TV and so forth. For Mac users, iMedia Converter for Mac is a helpful app to encode videos for further usage. Here is the review. Besides, all of the softwares are 100% clean and easy-to-use with just 3 clicks (“File” to add source video, “Format” to select 3D format and “Convert” to finish the process) and get the excellent 3D MP4/MKV/AVI/MOV/WMV content output. In “Settings” window, you will be allowed to adjust video and audio parameters and 3D depth and preview the output video size in the chart below. What’s more, you even can add subtitles, trim video footages, crop unwanted area and so on. They will be your best partner in Home Theater to watch 3D movies.